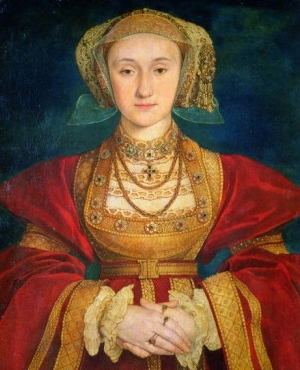 Anne Of Cleves was the fourth wife of King Henry VIII. His third wife, Jane Seymour, had died a few days after giving birth to his much wanted son, Prince Edward. The King was devastated at her death and, now that he had his male heir, was in no rush to remarry. However, his ministers, especially Thomas Cromwell, believed it was in the best interest of the country for him to remarry. England, now Protestant, could benefit from an alliance with the Protestant Dutchy of Cleves, so Anne, the sister of the Duke of Cleves, was put forward as a potential bride. Henry did not like the idea of marrying a woman he had never met, but after he saw a portrait of Anne, which showed a handsome and demure young woman, Henry was smitten. A marriage contract was drawn up and Anne, an unmarried woman in her twenties, left Cleves for England. As soon as Henry met Anne, however, he did not want to marry her. He found her physically unattractive, even though the portrait is said to have been a fair likeness, and intellectually uninteresting. Anne was largely uneducated and lacked the sophistication of the English women at court. She lacked Catherine Of Aragon’s courage, lacked Anne Boleyn’s charisma, and lacked Jane Seymour’s charm. It was too late to back track, however, and the marriage went ahead in the January of 1540. By the summer, Henry and Anne were divorced. While Henry had grown to like Anne, and they enjoyed playing games like chess together, he did not love her and was not at all in love with her. She felt the same. Their marriage was never consummated and this made an annulment easy. Anne, unlike Catherine Of Aragon, did not contest the annulment and for this was rewarded well. She was given several estates, worth a lot of money, and lived in luxury for the rest of her life. In Henry’s lifetime, at least, she was known as “The King’s Sister”. Of all Henry’s wives, therefore, it can perhaps be said that Anne fared the best!